General Hospital (GH) spoilers reveal that Anna Devane (Finola Hughes) has no shortage of men willing to work with her, some more willing than others. 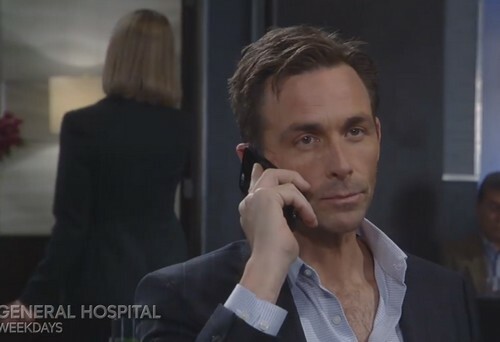 In a new GH promo video, Valentin Cassadine (James Patrick Stuart) informs Anna of his former partner in crime, and new boss, Cassandra Pierce’s (Jessica Tuck) plan to produce a synthetic opiate that is cheaper and more addictive than what is available on the market and streets right now. Dr. Hamilton Finn (Michael Easton), who was initially dragged into the investigation by Anna through blackmail, had returned to help her willingly when he had a patient come in who had overdosed on a synthetic opiate, reminding him of his own weaknesses and struggles with addiction. After, much reluctance, Anna reveals to Finn that the only thing Cassandra needs to complete her production is someone to perfect the formula – as soon as that is complete, she can start distribution. 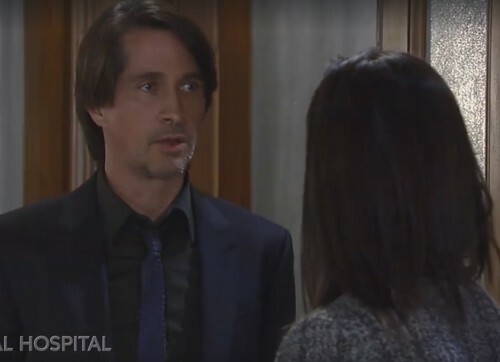 General Hospital spoilers tease that Anna is more determined than ever to stop Cassandra and her plan to build her drug empire. She wants to put an end to the production before she manages to get the drug onto the streets, injuring and possibly killing thousands of addicts. Finn, scratches his head, pauses, but, any fan of the show knows exactly what he is thinking. Finn offers to make himself the sacrificial lamb. He tells Anna there may be a way to stop Cassandra before she claims a single victim, and when Anna asks how he proposes that to happen. He suggests they give her exactly what she wants. Do you think Finn will use Cassandra’s trust in him as her physician to make his way into her organization and work from the inside? Of course once Finn begins to work on Cassandra’s deadly opiate formula he will put his life on the line as any perceived betrayal could be fatal. Be sure to tune into ABC’s General Hospital (GH) to catch up on this story and so many other exciting things happening right now in Port Charles. Check CDL General Hospital spoilers often for updates, news, rumors and spoilers!